The video posted below is part of a tutorial series on customizing and using Cardpointe by CardConnect. 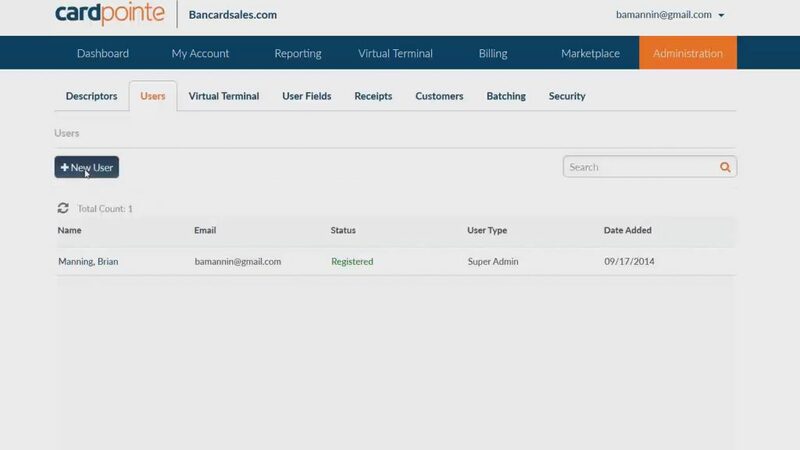 This video shows how to add and remove users within Cardpointe Online. You can set user permissions, add or remove users and set permissions to receive statements by email, or withing the Cardpointe dashboard. Cardpointe is by CardConnect – all trademarks and rights given to CardConnect. Here you’ll see a list of all the users who currently have access to your Cardpointe merchant account. If it’s your first time here, the only user you’ll see is the SUPER ADMIN which is the master login and the same one that is created when you first set up your Cardpointe account. Fill out the first name, last name and an email address so that the new user can create their own password. Then be sure to set the correct USER TYPE from this dropdown box. Your options are: ADMIN or STANDARD user. From a functional standpoint an ADMIN user has all the same abilities as a SUPER ADMIN. The Super Admin is simply the first user on your account and cannot be deleted. Then you can choose from the options below for additional permissions. Leaving all of them unchecked will simply give the user the ability to run transactions and fill in all the user fields that have set for them. The Reporting and Billing sections work the same way! Leaving the boxes unchecked restricts permission and checking them gives permission to use that feature. Once users are set up you can always change permissions are any pointe by going back to the ADMINISTRATION, then, USERS subtab. One additional feature of Cardpointe is that you can set Dashboard and Email notifications for each specific user. The account I’m viewing right now is a SUPER ADMIN account so there is not an option to change user type but if you are editing anyone other than the SUPER ADMIN, a dropdown box will show up and you can change them to either ADMIN to STANDARD . Dashboard and email notifications subtabs are available to you by checking or unchecking the line item that you want to be made available. This set of subtabs are available for edit after the user is created. Remember that this is customized by the merchant account which is why you have a Merchant account dropbown box right available to you. FInally if you click the transactions subtab, you can see all the transactions run by that user in a downloadable report. For more on Cardpointe, click on the link in the description or that tab on the screen. I’m Brian Manning…. And thanks for watching.